Father Hector Godoy is a committed shepherd of the Santo Domingo diocese. 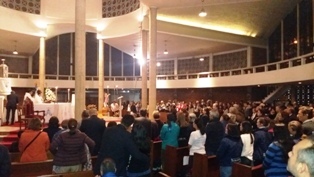 He is in charge of two parishes that are in the peripheries of the diocese: the parish of Jesus de Gran Poder (Jesus of Great Power) and the Parish of Our Lady of the Angels. From the 19th to the 25th of September, the Icon of the Czestochowa Virgin visited the area of ​​San Vicente del Nila (which belongs to the first mentioned parish) where there is a large chapel that accommodates this quite large community. From Sunday September 10 to Tuesday September 19 the Virgin of Czestochowa visited the parish community of Christ the King of New Israel. 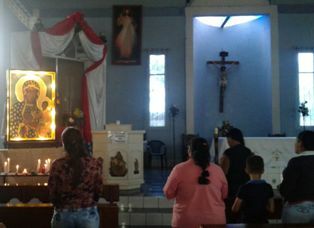 The main church of the Parish is 17 kilometers from the city of Santo Domingo, on the way to Chone (Manabi), with a population of about 6 thousand inhabitants. 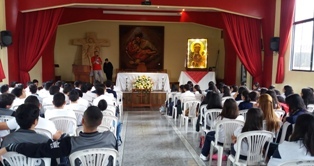 Students from the Washington Pazmino Vargas Fiscal School of the parish of San Jacinto de Bua in the province of Santo Domingo de los Tsachilas were present to welcome the Icon of Our Lady of Czestochowa that travels the world in a pilgrimage, carrying the message that is so much need by the Latin American peoples. 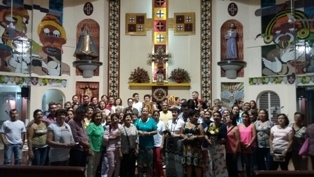 From the 2nd to the 7th of September, Our Lady of Czestochowa was present at St. Jacinto Parish in San Jacinto at the Bua. 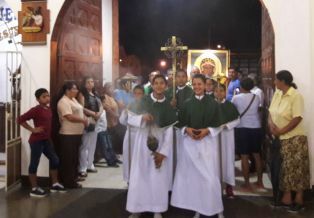 San Jacinto del Bua is a rural parish in the province of Santo Domingo de los Tsachilas, located in the northwestern center of Ecuador, 40 minutes from the city of Santo Domingo. It is 284 meters above sea level and has a population of approximately 11.000. Our Lady of Czestochowa in Her Icon visited the Nazareth School and shared two weeks with students, from Saturday August 18 to Sunday September 2. The students had the opportunity to contemplate and pray in front of the Icon in the chapel of the institution. 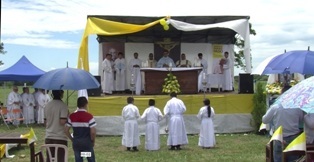 The visit to Arauca had a specific purpose, to meet the bishop, Monsignor Jaime Muñoz Pedroza, and the community that is carrying out the construction of a sanctuary in honor of the Queen of Poland. 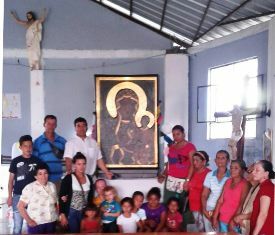 The last stop in Colombia was the Diocese of Arauca. This area is especially dedicated to the Virgin of Czestochowa, as the bishop of the diocese, Monsignor Jaime Muñoz Pedroza, some years ago saw the need to ask Our Lady to help heal the deep wounds left by the conflict between the government and the guerrilla, and there is none better than the Virgin that shows on Her face the pain and the cuts. The last day of the stay in Bogota of the organizer of the international Icon pilgrimage of Czestochowa, on Tuesday, August 29, was very symbolic. 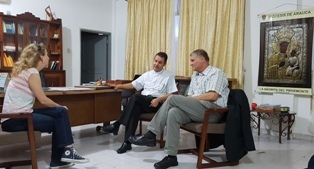 He met with a group of leaders gathered in the Parish of the Oblate Missionary Fathers. María Carolina López and María Madre del Amor Perpetuo responsible for the evening coordinated everything. The beautiful city of Bogota is waiting to receive Pope Francisin in a few days. All their expectations are set on this visit that will surely renew the faith of the Colombian people and will bear fruit in religious vocations. However, Lech Kowalewski, the international coordinator of the Czestochowa Icon pilgrimage had the opportunity to meet with some individuals and groups to discuss the Ocean to Ocean Initiative. 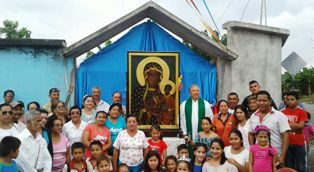 In Ecuador the Virgin of Czestochowa Icon is in good hands, but for Our Lady it is important to travel next year to Colombia the sister country, It is necessary to make friends with people committed to the defense of life. 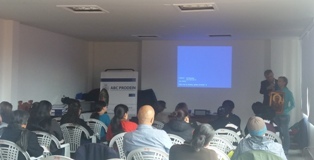 That is why the international coordinator of this initiative, Lech Kowalewski, traveled to Colombia.